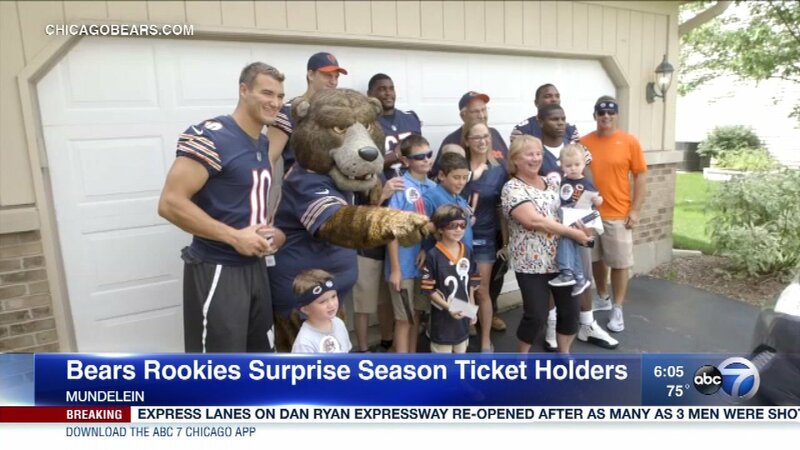 Chicago Bears rookies make a surprise delivery to season ticket holders in Mundelein. MUNDELEIN, Ill. (WLS) -- What better way to get Bears' season tickets than from the Bears themselves! Season ticket holders in Mundelein were sure surprised when they got an unsuspecting knock on their door. Some of this year's rookies surprised the season ticket holders by delivering their tickets to their homes. They also hooked them up with some Bears goodies! Members of the group included running back Tarik Cohen, defensive back Eddie Jackson, offensive lineman Jordan Morgan, tight end Adam Shaheen, quarterback Mitchell Trubisky, Hall of Famer Dan Hampton and Staley Da Bear.